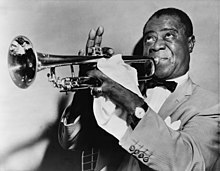 Louis Daniel Armstrong (1901 nî 8 goe̍h 4 ji̍t - 1971 nî 7 goe̍h 6 ji̍t) sī Bí-kok New Orleans chhut-sin ê jazz là-pa-chhiú kap koa-chhiú. I sī jazz im-ga̍k ê tāi-piáu jîn-bu̍t chi it. Armstrong chāi-seⁿ ê sî-chūn, tiāⁿ kóng kā-tī sī 1900 nî 7 goe̍h 4 ji̍t chhut-sì, chóng-sī i kòe-sin liáu-āu, gián-kiù-chiá Tad Jones chiah hoat-kiàn chiàu siū-sé kì-lio̍k, chiàⁿ-káng ê chhut-sì ji̍t-chí èng-kai sī 1901 nî 8 goe̍h 4 ji̍t. ↑ The TIME 100. Louis Armstrong. TIME, Stanley Crouch, June 8, 1998. "For many years it was thought that Armstrong was born in New Orleans on July 4, 1900, a perfect day for the man who wrote the musical Declaration of Independence for Americans of this century. But the estimable writer Gary Giddins discovered the birth certificate that proves Armstrong was born Aug. 4, 1901." Retrieved January 8, 2009. Chit ia̍h siāng bóe tī 2017-nî 2-goe̍h 5-ji̍t (Lé-pài), 14:01 ū pian-chi̍p--koè.